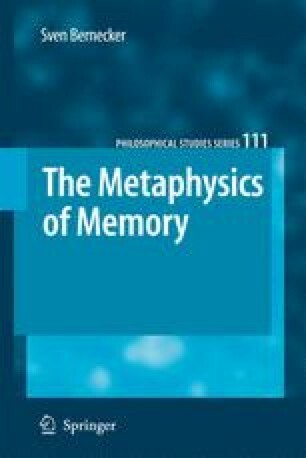 The idea behind the causal theory of memory is that a claim to remember something implies, not merely that the rememberer represented it in the past, but that his current representation is in some way due to, that it came about because of, his past representation. The memory state must not only correspond to, but must also stand in an appropriate causal relation to, his past representation. The goal of this and the subsequent two chapters is to motivate and explicate the causal condition of memory. Since it is the same causal process that underlies meta-representational and reproductive memory, the meta-representation/reproduction distinction will be of no importance in what follows. Though there is widespread agreement that memory requires some kind of causal process it is far from clear how memory causation should be construed. There are numerous causal accounts of memory which differ from one another in two respects. First, some theories claim that memory causation is contiguous while others deny it. Second, different theories of memory propose different interpretations of causal dependence. Among the interpretations of the causal dependence of memory are analyses in terms of necessary and sufficient conditions, as well as counterfactual and probabilistic analyses.